Google needs to be in the hardware business. It’s infiltrated nearly all aspects of our lives to an alarming degree. It controls our emails through Gmail, knows where we go through Maps, has a list of every person we communicate with via Android, and understands our every interest thanks to its search engine and Chrome. Yet it’s gonna hit a wall soon. A company as large as Google can’t infiltrate every point of the human experience with software and services alone. It needs to be producing the phones we text on and the computers we browse on. Last April it was reported that Google was aggressively hiring a hardware team in preparation for a big push, and sure enough, by the end of the year, the company had released a whole line of gadgets across categories ranging from smart phones to smart speakers. One year later, there have been some setbacks. 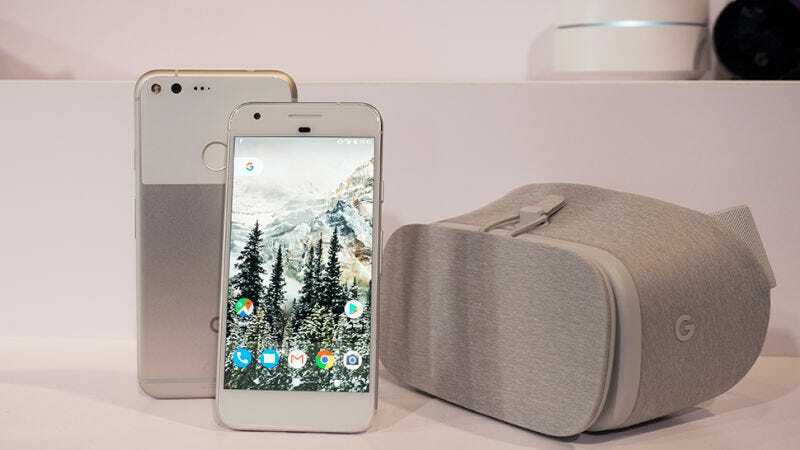 On Thursday, David Foster, whom Google poached from Amazon to guide the development and release of the future Pixel phones, departed from the company. Foster’s initial hiring appeared to be a big win for Google last year. He ran Lab126 at Amazon, the lab responsible for the Kindle, Fire, and Echo. Working under fellow poachee, Rick Osterloh (who was a big Motorola Mobility exec), Foster was going to take over the reins of the Pixel, a phone that was announced only a few days after his joining the team. With Google’s I/O developer conference coming up next month, let’s take a look back at that “well reviewed” Google hardware. Last year I/O was where Google announced both the Home and Daydream—two products that seemed like they could redefine their respective categories. And the products turned out well enough. But now that we’ve got a little distance for perspective, it’s worth asking whether the year Google got serious about building its own hardware was actually good. In the controlled settings of the Google Pixel launch, Google’s first in-house phone seemed to be some kind of genius. Not just because it came in a vibrant blue version, but because Google Assistant, the company’s answer to Siri, seemed to be genuinely smart. Now, six months later, we’ve all seen the Samsung Galaxy S8, and the Pixel feels more outdated than ever. Sure, the S8 shipped without its digital assistant intact, but its hardware is the best you can get. There’s no phone with better specs or looks. The Pixel looks downright embarrassing beside it. It looks more like a rip-off of an old iPhone than like the first phone from one of the largest and most influential tech companies in the world. The next version of the Pixel will need to be more forward thinking. Unfortunately, the few rumors we’ve heard about the product suggest it will be chasing Samsung’s glory by rocking a curved display. Come on Google, you can be more innovative than that! Announced in October 2016, and available in December 2016, Google Wifi is a very nice little mesh router. For $300, you get three, so you can place them all over your home to blanket it in wi-fi (a single router retails for $129). It’s attractive, and pretty easy to set up, and if you’ve ever seen Eero, then you’re going to scratch you head, because they’re a lot alike. The two products neck and neck when you test them speed wise as well. They even have similar software. The only difference besides price (Eero is $100 more)? Eero’s been out since 2015. Google’s first in-house router operates at the same level as a year-old crowdfunded device. I really, really liked Google’s answer to the Amazon Echo when it first came out. It’s more attractive, has better audio, and ties into Google Music—my music player of choice. There’s one by my bed that I try and use on a regular basis. I say try, because I am positive the Google Home has gotten stupider since it was released in November 2016. When you have smart devices like the Home or Echo, you learn to always enunciate clearly when speaking to them. I call it the “Echo voice.” The Home often struggles to understand that. Sometimes I get exactly what I have requested. Other times it forgets that it can do something it did THE DAY BEFORE. I ask it the weather. I ask it to turn off the lights. I ask it to play some music to sleep to. The genius of the smart home has apparently been bumped in the noggin one too many times since purchase. But Google keeps promising the Home will get better, and it has actually added some new features. If you have a Chromecast or Android TV you can actually control it via voice—the 50-percent of the time Home understands you. A bright point in a cloud of “eh” products. The Chromecast Ultra works great. But it is also just a regular Chromecast, now streaming in 4K. So it isn’t any kind of game changer—certainly not like the original Chromecast. Okay. This is actually an innovative product from Google. Its design, all soft like an old t-shirt, is infinitely better than the ugly plastic goggles everyone else makes, and its small controller, that neatly slots into the headset when neither is in use, is so smart Samsung went and copied it with the latest Gear VR. With Foster gone, Google’s got a chance to shift things around internally. And it needs to. Google IO is only a few weeks away. Last year, Google announced both the Home, and Daydream to wonderstruck its audience. This year, that audience will be much more savvy, and Google’s going to need to have something extraordinary under the curtain.